Today’s post will be entirely dedicated to me! I feel like spell and magic. I’m not talking about eerie Halloween magic. I mean air vibrating, light hiding reflections and gleams, things happening without a logic explanation, just because you feel they should be nothing different than what they are. I want to live charm and dreams, I want to believe in what I do, and do what I belive in. I’d like to be the protagonist of a story, of my story, meet fairies, find the golden pot at the end of the rainbow following an old lady’s advice, feel a well known smell and let my heart guide me along a path illuminated by the warm autumnal sun. Belive me! I have smoked nothing strange, and I haven’t met absinthe green fairy! It’s just that, after a few months spent chatting about recipes, pictures and my childhood, I was feeling like telling you something about me, now: I need do believe in this subtle magic, I need to believe I’ll find it in my life, sooner or later. 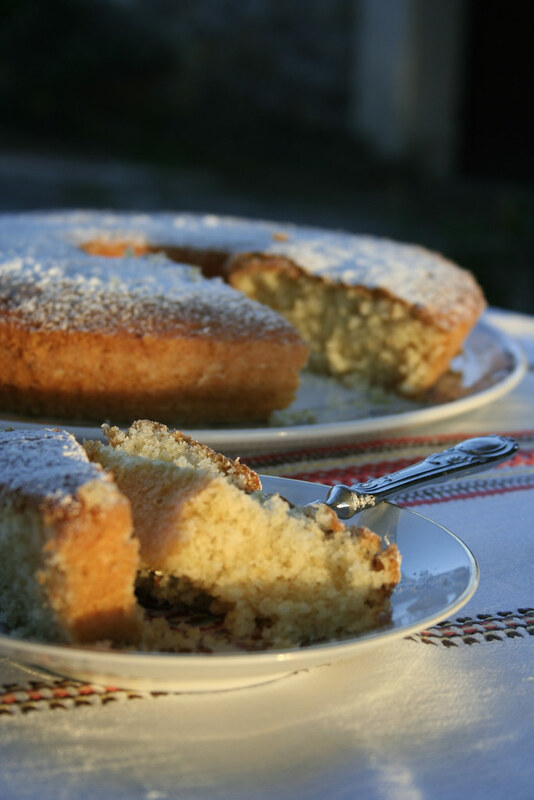 There is a special way to get in touch with this spell, you must carry out an old and reassuring ritual, making a ciambellone (a ring shaped cake) on Sunday morning. To enhance the power of this magic appeal, I put myself in a spice seller’s shoes, and I made a different cake, not the usual olive oil or water ciambellone, typical of my childhood, but I followed a new recipe, the one from Adelaide Melles, as written in Mariù’s last post: grated Tonka beans and a Madagascar vanilla bean. Mix, stir, add magic ingredients and bake. Magic is performing. Beat sugar and eggs with an electric beater. Add water and seeds oil. Now sieve in flour and grate half of the Tonka bean with a small grater (I used the one I usually use for nutmeg). Open vanilla pod and scrap seeds with a knife and add them to the batter. Sieve in baking powder and add grated lemon peel. Stir for the last time and pour the batter into a ring shaped mould, previously buttered and dusted with flour. Bake for 40 minutes in preheated oven to 190°C. Test it with a skewer to check if it is completely cooked inside. Remove from the oven and let it cool down before serving it, dusted with some icing sugar. It seems that it will be soft and delicious for long time, it seems. I made it yesterday but it’s already finished, neither a crumb left. 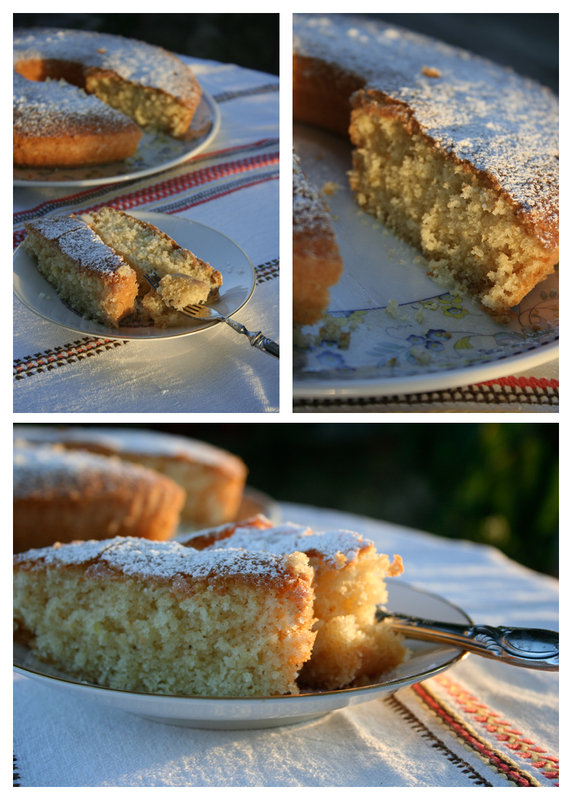 Everyone was asking for a slice more, because it is so good and soft, never tasted something like that! Finally I received my order from Madavanilla: together with cinnamon, vanilla pods, aniseeds and jasmine blossoms I bought Tonka beans: they seems peach or apricot stones, dark and wrinkled. The smell is very strong, especially when you grate them. The flavour reminds of vanilla and almond. Bit by bit, magic is coming, called by a strong fragrance and satisfied smiles of those who have tasted my ciambellone.